For the last seven years, Metro’s service-change planning has been driven by the agency’s Service Guidelines, adopted by the County Council to professionalize a planning process that had been increasingly driven by political pressure on individual Council members. The Service Guidelines process has been enormously helpful to the agency over time, allowing it to prioritize hours in a way that benefits the highest number of riders (with a special emphasis on riders from disadvantaged communities written in) and enables continued ridership growth. Part of the Service Guidelines process is an annual report on system performance, now called the System Evaluation. The report highlights areas where investment is needed under the Service Guidelines in three priority areas: 1) overcrowding, 2) schedule reliability, and 3) service growth. It also contains a treasure trove of route-level reliability and ridership data. Metro recently released to the public the 2018 System Evaluation, which is based on data collected after the fall 2017 service change. The report identifies various needs scattered throughout Metro’s system, but two particular areas of focus jump off its pages. The first is that endlessly congested traffic conditions in South Lake Union continue to present major reliability challenges for north-south transit in that area, even after continuous investment of large numbers of hours in SLU service over the last four years. The second is that most of the highest-priority needs for overall network growth, rather than spot fixes, are in South King County outside of Seattle. The SLU needs are not a surprise to anyone who ever travels through the area. Every north-south route through SLU except route 70 appears on the list of routes needing reliability improvement. 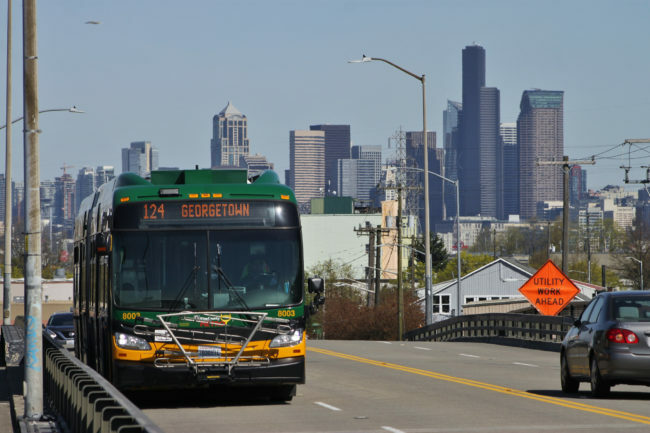 Routes 62 and 40, the two highest-ridership core services connecting the heart of SLU with North Seattle, need the highest investment of all routes on the list. Unfortunately, “investment” that increases running time and recovery time is of only limited use to stuck passengers. The continuing reliability challenges in this area underscore the need for much more comprehensive transit priority, especially longer bus lanes with fewer gaps at problematic intersections such as those at Mercer and Denny. The more fundamental challenge that comes out of this year’s System Evaluation is the need for major network investment in South King County, both in the all-day network and commuter service. Fully half of the routes requiring reliability improvement are South King County routes, and the report specifically calls out declining reliability of I-5 South commuter service. In the network growth category, six of the top ten priorities for growth are South King County routes. Reviewing past System Evaluations reveals that underservice in South King County is not a new phenomenon. But it has been thrown into sharp relief with the improvements to the Seattle network funded through 2014’s Proposition 1. The Eastside has had relatively generous service for years in comparison to ridership, thanks to the politically driven “40/40/20” (Eastside/South/Seattle) service growth formula that ruled Metro during the 1990s and 2000s. More recently, Proposition 1 corrected a significant amount of historical underinvestment in Seattle service. Now, needs in South King County increasingly stand out. Under the Service Guidelines’ equity-driven approach, the higher concentration of lower-income and minority residents in many South King County communities only reinforces the need for further investment in the south end. The King County Council as a whole should be prepared to listen to what the System Evaluation is saying, and prioritize the investments in South King County that it recommends. In major South King County destinations, ridership exists to support a frequent network comparable to the one Proposition 1 has helped Metro build in Seattle. Building that network needs to be Metro’s and the Council’s first service development priority in the near future. Yes, yes, yes. I’d love to see a survey of how early the South King Sounder parking garages fill up. Couple that with how many train trips you can functionally take (not many, and they are all early) if you don’t have reliable bus service to and from your home (or a nearby church lot or street parking). You have your answer. We could be much more effectively moving people between the affordable suburbs and Seattle/Bellevue, IF we could only get efficient and reliable bus service. Take a look at the Metro system map. What’s the spacing between those bus routes in South King, and what are the headways? Every mile, two miles in places? 30 minutes? An hour? How about the topography? How about a survey of where the density is? There are horribly-underserved parts of East Hill that are denser than many Seattle neighborhoods. Inventorying the apartments and other dense housing would be a useful pre-cursor to planning RapidRide lines. Having the RapidRide lines reach the regional light rail spine would also be a nice feature. Last I looked, the 169 RapidRide was going to be the only RapidRide line that won’t reach Link. Brent, I agree on a survey of density, as well. There are a lot of apartments throughout Kent, Renton, and Auburn. I don’t necessarily see connection to Link as an end-goal, unless it works logistically. Auburn-Kent-Renton makes sense for a rapid ride. It connects to two Sounder Stations, and will hopefully connect to a ST BRT line to Bellevue and the Metro 101 to downtown Seattle. Getting good local routes that string the densest neighborhoods together and connect people to both the Sounder and Link is important. As we’ve seen Kent & Auburn Station parking garages fill up earlier and earlier, year after year, we see that there is a necessity for local service to Sounder. A Rapid Ride that gets you to Sounder and to a very reliable route like the 101 is helpful. Supplemental to that, more local routes to get people to the Sounder from individual neighborhoods is also necessary. Actually Madison RapidRide doesn’t “reach Link” either. It’s still a block away. One block “reaches Link”. The problem is things like going from eastern Kent or Renton to Kent Station or downtown Renton and transferring to another bus just to get to Link, making a 3-seat ride, or 4-seat if your destination isn’t directly on Link. Mike Orr, one solution would be to get a good grid of bus routes once Link extends further south, that intercept both Sounder and Link, and reach east of 167 and west of I-5 into neighborhoods. You still need the north-south RapidRide (or at least a north-south local), because it is many miles (not walkable) between Sounder stations, with a lot of commercial areas and dense apartments. Sir, you have hit on another of the problems with south end transit. Nothing is direct. When you post the question to a local elected official, you get a BS answer that shows they’ve never even tried to use the system, themselves. When you follow up with an explanation of how bad the system really is to use, they shrug their shoulders, give some sort of cheezy excuse, or refer you to somebody at Metro to send comments to. I used to have a three-to-four seat ride (depending on time of day) that I would routinely reduce by driving to the transit center down to a two-to-three seat ride. Of course, if I did that today, I’d have to leave my house at 5 am to find a parking space, which is one reason I don’t work in Bellevue anymore. If the bozos running the transit agencies would model the commutes that thousands of people on the freeways do each day, they would figure out where transit is actually needed. They could probably come up with a handful of “flyer stops” just like we used to have on 520, except along I-5, 167, and 405, with feeders from the neighborhoods. But they don’t bother to do this, so they never come up with a system that works. Instead, we spend millions and millions and millions for specialized freeway ramps, flyovers, massive bloated transit stations, with high utility for a small segment of people. I want to see the most basic, barebones improvements to get as many people on transit as possible. That’s what 405 BRT and frequent 520 service (UW-Overlake) is intended to address. You need “specialized freeway ramps and flyovers” in order to connect the feeders to the flyer stops; otherwise you have a long, unpleasant walk between them, which depresses ridership. The density and needs are already known to some extent. Kent between downtown and East Hill is the highest-density, highest-ridership area in south King County, and is also a lower-income, diverse area with many low-budget local businesses. It probably ranks third-highest in King County after Seattle and the Bellevue/Redmond tech axis. The 150 currently takes 45 minutes off-hours and 55-60 minutes daytime. Link+180 can’t match 45 minutes even with zero transfer wait, and Link+KDM RapidRide will probably be the same. So there’s no hope to lessen the travel time to Seattle. Given that, the routes should go through downtown to East Hill so it’s not a 3-seat ride. Most of Kent’s population lives east of 100th (as do most of Renton’s population), so they need better connections to the region, especially if we want to promote them as a lower-cost option for housing and make car-lite living there more feasible. 1) RapidRide KDM – Kent – Green River CC (Parts of 166+164, without Reith Road. This gives a one-seat ride from KDM Station to East Hill and 124th Ave SE (northeast Auburn). 3) Express downtown – Kent – Auburn. (The missing part of the 578.) It’s unclear to me whether it would serve Renton TC or Southcenter. Mike Orr, you must have been writing yours as I wrote mine. Yes, a grid would be amazing. Slightly further south, it looks like there’s a proposed Federal Way — Outlet Mall — Downtown Auburn — Green River College RapidRide route as well. That seems to make lots of sense. I’d think there needs to be some discussion about that huge trip generator for both employees and casinos called Muckleshoot — the biggest casino in the state! There is nothing more proposed than what’s near there today. I would think there are political reasons about transit service there (funding for example) but anyone on SR 164 sees pedestrians walking the two miles between the casino and central Auburn (which has no sidewalks in places so people are walking in narrow breakdown lanes). The whole South Sound, today, is a big transit hole. I hardly ever go there, but pretty much, it falls into the category where, if I had a really important reason to go there, I’d rent a car, and if the reason for going there isn’t important enough to justify the cost of a rental car, I would simply not go. There are several challenges that make serving the area well with transit very difficult. Walkability is terrible. Sidewalks are narrow and directly up against streets with very fast moving cars and very limited crossing opportunities. This forces buses to make a choice between taking a direct route down a major street, and forcing people to put their life at risk to cross the street, or have the bus meander down the less-busy streets, which makes local access safer, but the route much slower, and therefore, less attractive to riders. The area is also extremely spread out in both dimensions, which means you can’t avoid transfers like you often can in Seattle or Bellevue by walking the shorter segment of the route. And, once you finally get to Kent Station, you still need to ride a considerable distance *another* bus (or train) to get elsewhere in the region. Ultimately, the lack of basic respect for non-motorized travel has to be fixed in order for transit to become attractive. When fifteen percent of your neighbors rank taking the bus to work #3 or higher in their list of desirable ways to get to work, things will change. Metro has tried “attracting” ridership from the burbs over and over. As long as the tax revenues and driver pool ore the limiting factors on bus hours AND in-city buses are SRO, it makes no sense to repeat the same futile mistake. Folks live in the burbs for many reasons, but one of the primary ones is that they prefer driving to busing. They’d rather fight (traffic) than switch. Build it and they will come. Metro has not tried very hard to attract ridership in south King County because the public hasn’t given it enough service hours to make a full-time frequent grid. If the multifamily areas had the level of transit Prop 1 has provided in Seattle, ridership would increase significantly and you’d get more choice riders. Most South King County routes are 30 minutes daytime, 60 minutes evenings and Sundays. Not many people are willing to ride those, especially if it involves transters. And the main reason to care about transit in the suburbs is a lot of lower-income people can’t afford to live in places like Seattle, spend most of their income on necessities and are living paycheck-to-paycheck, so having to drive is a major expense and could bust the budget. Tom, we moved to the burbs because it is all that we could afford. We actually planned to eventually buy a house or condo in Seattle one we could afford it, but home prices in the city skyrocketed while ours stagnated. So we got jobs elsewhere! Must be terrific for you to have had good enough circumstances to have a choice in the matter. Lack of parental help, terrible timing, student loans, a recession, and the arrival of Amazon all were factors that pushed us out of the city, permanently. Just as living in NYC or San Francisco weren’t even options for me 10 or 12 years ago, Seattle is now out of the question forever. We aren’t low income, but are solidly “middle class,” and the idiotic real estate prices of Seattle aren’t compatible with a middle class income AND homeownership. I’ve seen from parents and grandparents that homeownership and lack of a mortgage vs. renting perpetually will make or break your retirement, and I don’t want to work well into my 70s, like one of them did. The “performance standard” that ought to matter in South Lake Union is not just speeds reliability and loading through the area, but whether the level of regional access is anywhere close to what’s justified given its growth and density. Is the mode share anywhere close to what it should be in a developing regional business center? In my opinion there has never been a real effort to realign or overlay service to get ahead of and shape travel to SLU, missing one of the biggest transit opportunities of a generation. I hope someone will look at service standards to see if they adequately address this type of performance based on land use activities, not just the stuff in the capacity and quality of service manual. The solutions are only partially about service levels, but have more to do with right-of-way and mode priority, which is out of Metro’s hands. These problems won’t be solved by congestion pricing, but by actually giving lanes to buses and giving signal light priority to buses. I’m always struck at how a reliably slow bus route that isn’t too overcrowded can’t get identified as a problem — like Routes 2, 3 and 4. Should some measure of insufferably slow bus routes be identified in this report? No good methods come to mind. The report examines corridors, but not granularly. Perhaps it is time to move beyond simply looking at where more bus service is needed to looking at where more bus right-of-way priority is needed. Put some local officials on the spot to explain why their cities are making it so hard for buses to travel through those cities. They tried to fix the 3 and 4, but too many people complained. They probably don’t think it’s worth their effort to revisit that again and I don’t blame them. And I think Metro is reluctant to make any permanent bus priority changes to the 2 (the Seneca street portion) because it’s redundant with the 12 (which has massive improvements already planned) and it’s widely assumed that after the next CD restructure (most likely when RR G opens) there won’t be any Seneca street service that is directly parallel to RR G.
I think you could look at the discrepancy between rides per platform hour and passenger miles per platform miles. For example, the RapidRide E does very well across the board on both metrics (rush hour, off peak, weekend). The 70 does really well in both metrics most of the day, but is just average at night. In contrast, the 8 does really well at all times in terms of riders per platform hour, but only mediocre on passenger miles per platform mile. This suggests that lots of people are riding the 8, even though it isn’t going that fast (unlike the E). The 44 is interesting because it does well in every metric except passenger miles per platform mile during rush hour. In other words, it seems to be moving fairly well most of the day, but is especially slow during rush hour (while the 8 is slow almost all the time). This suggests that either the 8 deals with more all day congestion, or it encounters more traffic lights. Either way it means that adding more right-of-way for the 44 is likely to pay off. The 8, meanwhile, would probably benefit from that, but it might also benefit just as much from signal priority or off-board payment. Either way, though, it is clear just by looking at the chart how some runs (like the 2, 3, 4, 8 and 44) do quite well despite being very slow, which is why it would make sense for the city and Metro to concentrate their efforts there. Passenger miles per platform mile is mostly a measure of how much load the bus carries on the average mile – basically whether there are deadweight segments on the route. Buses that run express on the freeway tend to do well relative to their passengers per hour because the freeway makes up much of both their length and usefulness. I don’t think it has much to do with how slow the bus is. I would think slow buses get dragged down in passengers per hour because they spend more time on the road. When you create a route (40, 62), that originates an hour away, travels on local roads, and has to encounter 40 to 50 traffic signals, of course it’s going to be unreliable. These two routes are both great neighborhood connectors, and should remain as such. Just please consolidate the service on 65th Ave NE so we don’t have four neighborhood connectors running the length of the same street, with mismatched headways, at least after Roosevelt Station opens. Let four (62/64/71/76) become one, and consider it not ending up going downtown, because of reliability issues. Perhaps combine route 45 with the eastern portion of route 62, and run it at Link headway all day. The western portion of route 62 could become its own route, terminating at Roosevelt Station. That’s the long range plan (at least according to the map). To be clear, Metro has said that the map does not represent an actual proposal, but simply a set of idea. Still, by 2025, they expect only one bus there, following the current 62 route (more or less). I agree that doing so makes a lot of sense. They cover the northeast View Ridge area (more or less what the 71 covers) with a circulator of sorts. It is basically the 78 extended to Sand Point, followed by reversing directions to get up to 75th, then west to Roosevelt Way and ending at the station. I take a different approach, as described here: https://seattletransitblog.com/2017/03/12/north-seattle-bus-routes-after-northgate-link/. In my proposal, you still have redundant service on 65th. I guess I don’t see that as being that bad, given the relative demand and speed there. Density gets smaller as you get further away from the station, so a split (of sorts) is not a bad idea, if it just makes sense from a geographic standpoint. To a certain extent, that part of 65th is simply “on the way”. Not that I’m thrilled with the way I handled that area. I plan on posting an updated version of that proposal, incorporating other ideas (that are clearly better than what I came up with). I will definitely look at reducing redundancy on 65th. Mainly though, I’m looking to improving the map, so that ideas like these are more easily communicated. Don’t forget that they both cross draw bridges. You could split them up, but that would make them less useful and/or a lot more expensive to operate. For example, the 62 could be split in Fremont. That is fine for people who live (or are trying to get to) Fremont, but it means that folks along much of the northern route would have a two seat ride to downtown. Even when Link gets to Roosevelt, that leaves most of Stone Way and Tangletown with a two seat ride. You can overlap the routes (up to 45th or even 65th) but then things get pretty expensive. You really haven’t added anything, other than better reliability. None of the trips are better, and some are worse. It is a trade-off, and it isn’t clear whether it would be worth it. Addressing the biggest bottlenecks (congestion) seems like the best approach, as that is at least a clear win for transit (regardless of the routing). The 62 is three very different routes in its thirds (downtown-Fremont, Fremont-Roosevelt, Roosevelt-Sand Point). Adding mega service to SLU would overserve NE 65th Street because it’s the same route (lucky for NE 65th Street, but unlucky for more deserving corridors). At the same time, it’s a welcome new crosstown corridor. You can’t split the 62 without breaking crosstown trips like Roosevelt-Fremont or Greenlake-SLU, so it’s a difficult tradeoff. Roosevelt to Fremont is pretty short to force a 2-seat ride; it’s not like downtown to Greenwood. It’s a judgment call whether NW 85th Street should be connected to the U-District or to NE 65th Street. But the established pattern of a northwest-southeast axis is very popular and connects northwest Seattle to a large urban center, so there arguments against breaking it. Other cities like San Francisco and Vancouver have fewer water/hill barriers and mixed-use/townhouses throughout, so crosstown grid routes are stronger. Seattle has islands of density in a sea of detached houses in residential-only areas, meaning the demand is to go go the urban villages rather than strictly east-west or north-south which misses everything. That’s the problem with 15th Ave NE, NW 85th/NE 65th, 23rd Ave NE, etc: they miss the nearby urban villages where most of the travel demand is. It’s frustrating to be on 23rd and have no direct access to Broadway, or on 15th NE and miss Greenlake and Northgate and the Crest Cinema, or on NW 85th/NE 65th and miss the U-District. So Seattle needs a compromise between a grid and connecting neighborhoods to urban villages/centers. The highest priority for Rapid/Frequent routes in my mind is to connect all the urban villages to each other. That supports both village-to-region and village-to-village trips, which is where the multifamily areas and highest-ridership areas are. North Seattle is mostly a grid, both in land potential and increasingly in Metro routes. Capitol Hill is blocked by I-5, Lake Washington, and 520 (the north end tapers down to a point with only Harvard Ave and Montlake Blvd to reach the U-District). Madison Park can’t get to the U-District without going down to 23rd. West Seattle and South Seattle are several north-south fingers: California, 35th, Delridge, 16th, SODO, Beacon, Rainier. The fingers are too narrow for a large 2-dimensional urban village like Chicago’s, and as a result they’re oriented toward downtown rather than each other, and their commercial potential is underdeveloped because there’s so little land in each finger, so there aren’t many destinations somebody would want to go east-west to. The 62 is a milk run, but so long as the 45 keeps its current routing there really isn’t much better you can do. Back in the old days I toyed with a NW 85th/NE 65th route and a route that mostly kept the then-existing 16 routing up to Northgate (though possibly attached to the old 26 routing on Latona). The current 45/62 routing has the advantage of providing stronger U-District connections and eventually connecting Fremont and Wallingford to Roosevelt Station. Ideally in the long term every Link station (at least in the city of Seattle) would be the hub of an urban village so a true grid would be more palatable, but at least when I still lived in Seattle and followed STB more closely, the city had mixed success upzoning the areas around stations. It’s a judgment call whether NW 85th Street should be connected to the U-District or to NE 65th Street. I agree. I think it is worth backing up and looking at why grids in general are such a good idea. First of all, they are efficient, in that you have no overlap. They also make anywhere to anywhere travel very easy — you just make a single transfer. When you deviate from the grid, it is worth looking at what is lost in that regard. In the case of the 45, heading to Sand Point would make the system more grid like. But how many trips have you actually lost? Technically, you haven’t lost any two seat rides, it just that the transfers are cumbersome (requiring a rider to go down to the UW, and all the way back). The destinations of this sort are east of Roosevelt Way (the biggest of which is Lake City). That is significant, but one that can be solved by sending more buses to Roosevelt (something I suggest in my Northgate restructure). If the current 522 and 65 are instead sent to the Roosevelt station (something that makes sense in general, as it would be the fastest way for riders along those corridors to access Link) then you really haven’t lost much by sending the 45 to the U-District. Only a handful of trips along Sand Point Way are bad. Greenwood to Sand Point itself or Children’s would be fast, frequent, 90 degree, two seat (ideal grid style) trips. It is only the relatively obscure, low density areas (like Mathews Beach) that lose out. With all due respect, big deal. I really don’t think there are that many trips like that worth worrying about. Again, those are still two seat rides. Folks probably gain more by improving the popularity of the system than they would by making it some ideal grid. A long, cumbersome two seat ride — or a three seat ride — is not great, but it is far better than if the buses run every half hour (or worse). By the way, my opinion on the 45 has changed. In my original proposal, I did send it to Sand Point. But the more I thought about, the more I realized that other people (and Metro) were right. Ridership would significantly decrease if that bus went to Sand Point (even after Link got to Roosevelt). A one seat ride to the the second biggest destination in Seattle (only a mile away) is just not worth throwing away for the sake of a “better” grid. I would also say that there are several caveats when it comes to trying to build a big grid. First, natural geography plays a big role. So does density, as well as distance. For example, it is very difficult to run east-west lines in north Seattle. At 65th, you have a (green) lake that makes it impossible to do that. West of there, the road is just too narrow and steep to run a bus. East of there is fine, which is why there is a bus line there. North of 65th it is a different story. To the west it is great (there is a bus line on 85th). But to the east you have very low density, and very few arterials. You just can’t go straight across, and build a good grid. There is simply no way to get up to Maple Leaf by following the arterials unless you “go around” and access them from the north or the south. This kills any possible grid — you have to muddle through with north-south lines. Second, you need both density and demand. If 95th was an arterial that went all the way across, it would still suffer on the eastern end because of relatively low density (and very little in the way of destinations). It is easy to say that every transit system should be a grid, but if you have a low budget system (because of relatively low density and relatively long distances to cover) then transfers become a huge burden. That is a big challenge in the suburbs, which is why very few suburbs have a grid. Oh, the 71. The 71 is a “councilmember override” like in the first sentence of the article. These were rampant until 2012 when the council passed a grand bargain to eliminate the Ride Free Area, replace the 40/40/20 rule with Metro’s new performance metrics , and pass a 2-year recession surcharge to forestall cuts. I think the council realized it could no longer afford to retain legacy dead weight whenever one person complained, or vetoing restructures because one person didn’t want to lose their one-seat ride. (For instance, in 2008 a new Othello Street route was to connect Seward Park to to Othello Station to counter the demands for P&Rs in Rainier Valley, but activists insisted on a McLellan Street shuttle (Beacon Hill – Mt Baker), which made the Othello route less frequent, and then hardly anybody used the McLellan Street shuttle. Similar things happened with the hard-to-die 42, and now the 106’s North Rainier extension that resurrects it from the dead. However, i don’t think there will be much support to continue the 71 when Roosevelt Station opens. Instead Wedgwood will be attached to a north-south coverage route. And everybody else on 65th has a north-south route to the U-District within five blocks, sorry if it goes through U-Village and campus first. 1) Gives all of north Seattle east of Fremont Avenue access to SLU. 2) Bridges a welcome connection between Fremont, Greenlake, Roosevelt, and Ravenna. 3) Connects 65tth to near-and-yet-so-far Magnuson Park. It’s insane that the 71 stopped short of it and turned to an ultra-low-density area, and the only east-west route from Madison Park was on lower-density, lower-business 55th, especially given the low-income housing in the park. Splitting the 62 would break #1 and #2, and reverse the progress in crosstown service. Of course something better might replace it, but what would that be? The 62 and 40 also combine in an interesting way. The 62 gives SLU access to north-central and northeast Seattle as I said. The 40 fills in the rest; i.e., northwest Seattle to SLU. That’s an idea whose time came a long time ago. If you just modify the 60 without any other changes, you’re going to be creating a problem for a significant number of elderly and disabled Capitol Hill riders who use it to get to the hospitals. But there are a variety of other ways to solve that problem, mostly using existing hours. As a frequent rider of route 60, I heartily endorse using it to connect First Hill to SLU, instead of duplicating Link service between Beacon Hill and Capitol Hill. Route 49 ought to be covering the Broadway/Madison/Harborview connection, with a frequency nudge to get it to Link headway, hopefully in time for the opening of Northgate Link. A frequent streetcar running most of the length of Broadway should be the preferred path between Capitol Hill and Little Saigon, or Link plus any of the several Jackson St buses, or Link plus a frequent streetcar, or Link plus walking a few blocks. You’ve got routes 63, 64, and 309. What are you trying to say? That people actually live on First Hill and commute to SLU? It is part of Metro’s long range plan (http://www.kcmetrovision.org/wp-content/themes/kcmlrtp/LongRangePlan/#) and is listed as frequent bus for 2025 (line number 1074). I think it could become RapidRide category, given the corridor (it would also benefit from improvements made to the Metro 7, which is slated to become RapidRide). I think the time to do a big restructure for that part of town is after Madison BRT gets here. I wrote a Page 2 entry about the subject (https://seattletransitblog.com/2018/11/15/east-seattle-bus-restructure/). We may have altered our traffic lights to prioritize autonomous cars over pedestrians by then. RapidRide 7. From Rainier, go straight up the hill on Boren. People going downtown get on Link at Mount Baker. Improve station connectivity since you’re doing Rapid Ride street improvements anyway. ID to downtown has many other options. The plan is to rearrange the 7 and 48, and make them both RapidRide (http://seattletransitblog.com/2015/12/21/rapidride-the-corridors/). This all would be well along in terms of planning if it wasn’t for the fact that the previous administration was corrupt, and lied about funding. Anyway, the basic idea is to truncate the 7 at Mount Baker Station (corridor 3), and then extend the 48 to Rainier Valley (corridor 4). The bus that serves Boren (mentioned earlier, in the Long Range Plans as bus 2025) would be in addition to all that, and actually serve MLK (not Rainier Avenue). It would be frequent, not RapidRide. I don’t like any of that. It seems to me that a bus on Boren should be RapidRide, as I would imagine ridership would be very high (especially if it was fast). I’m not sure if any shadow of Link on MLK should be frequent or RapidRide, either (I would either double up service on MLK, or truncate it at Mount Baker). There is no way you are going to get bus lanes on MLK (and you might actually lose a lane to produce bike lanes). Just an aside: I think Judkins Park is going to be more popular than Mount Baker for South Seattle riders once it opens in 2023. The station will have entrances on both sides of Rainier (compared to Mt. Baker’s 1/2 block away and only on one side. Even riders that would use the 23rd Avenue entrance/exit would have an existing pedestrian crossing and 23rd is really only two lanes of traffic there. Then, the ride to ID/C Station will be five minutes faster — making up the lost time on the bus (unless Rainier backs up horribly like it does many weekday mornings) combined with the extra time of a minute or two to cross Rainier Avenue. Of course, after 2035 the MLK/SE Seattle Link line is planned to go into a new tunnel before ID (maybe an obnoxiously deep tunnel) so that riders wanting to reach existing DSTT platforms will have to transfer trains (making the trip a double transfer). That will make Judkins Park Station even more appealing for riders that aren’t headed to SLU or Ballard. Part of the reason Metro is proposing splitting the 7 (which past experience tells me Rainier Valley residents would scream bloody murder over) with the southern leg being connected to the 48 is because that’s what SDOT called for in its Move Seattle plan, and I said at the time that that plan showed that SDOT should leave routing to the experts. I don’t know if what I’m looking at is the most recent System Evaluation (though I pulled it up within the last week), but I was surprised to find how poorly the 48 was doing (in Spring 2018), with off-peak passenger miles/platform mile in the bottom quartile of urban routes and off-peak passengers/hour on par with the 21 or 24, which doesn’t seem like it justifies RapidRide investment. I wouldn’t have thought the northern segment of the old 48 was the bigger driver of ridership, yet the 45 is substantially more productive off-peak. The 48 is likely to improve when East Link opens, but the 45 doesn’t have Roosevelt Station open yet either, and the northern 7 will connect to Judkins Park station same as the 48. One thing splitting the 7 does allow Metro to do is through-route the northern 7 with Eastlake-Roosevelt BRT (as such a route might be prohibitively long if it went all the way to Rainier Beach, especially if Metro still intends to eventually extend Roosevelt BRT to Northgate). The LRP proposes doing so through downtown, but doing so via Boren would make a lot of sense; Boren effectively continues on each end as Fairview and Rainier. That was the original idea but I think both Metro and SDOT have been moving away from it. It was always debatable whether a Rainier-23rd route was better than a Rainier-Jackson route. Either of them would serve Judkins Park Station, which will have entrances on both Rainier and 23rd. Judkins Park station will probably become a sleeper hit. It avoids three intermediate stations to downtown and the surface SODO segment, and it gives direct access to the Eastside. Commutes between Rainier and the Eastside have been increasing since the early 2000s, and will doubtless increase much further. Newcomers don’t know much about Rainier Valley’s history and obsolete unsafe reputation; they just see that rent/house prices are more of a bargain than in Central Seattle or the Eastside. Re 48 performance: the route ridership is heavily affected by Link. Before 2016, it was how trips from SE Seattle and connecting South King to UW were often made. UW Link station took those trips. Also 23rd lost a lane so buses move slower. On the other hand, the Judkins Park Link Station opening could bring more riders to the route . I’m hesitant to split Rainier Avenue up because the unity of the valley is one of its strengths: the whole thing is a continuous urban village, and a lot of people ride buses from one part to another to do errands rather than leave the neighborhood. Splitting the 7 severs this. Just as grid routes are important, serving the entire length of large urban villages is important too, and in Beacon/Rainier’s case the diagonal arterials are the grid. The argument for splitting the 7 seems to be that North Rainier is industrial so few people from South Rainier go to it, but I doubt that’s the case, and there will be more trips over time as North Rainier gets more housing and businesses. And people go through North Rainier to the Jackson Street businesses, and it’s only a mile gap, so why not keep it unified? Are there really more people who want to go to 23rd (or through 23rd to the U-District)? I’m starting to see Rainier-23rd as useful but I still worry about splitting Rainier. The greater U-District urban village is from UW Station to 65th. I lived on 56th and saw that firsthand, and took the 48 plenty of times to my home. I thought both the 45 and 48 would overlap to 65th, but instead Metro truncated the 48 at 45th. That’s where a large chunk of riders were lost. The 45th does exactly what it should: it goes all the way through the village to the far end (UW Station), so that’s what riders switched to, and the reason for the big jump on the 45 and big loss on the 48. The 45 is also routed slightly differently: it runs on pedestrian-heavy University Way rather than car-oriented 15th, and it goes more directly to 65th & Roosevelt rather than making that button-hook via 65th & 15th. See, I haven’t lived in the north U-District since 2011 (and towards the end of that time there was a sense that our rent was going up as more university folk were spilling into the area), but my impression was that the density dropped off considerably north of 50th, to the point by the time you got to 55th I had a hard time considering the area part of the U-District at all. Roosevelt then became its own thing, albeit with too much single-family housing to be a true urban village, centered on Roosevelt Way and 65th and extending from Ravenna Blvd to 15th on the east and 75th on the north. Granted I lived closer to Roosevelt, and 15th, where the 48 ran, is/was more consistently lined with apartments in the area you mention, but still, I’m not surprised Metro wouldn’t have truncated the 48 any further north than 50th, and 45th makes sense since a) the 49, which fills a similar role, has long terminated at 45th and 11th and b) Metro probably sees U-District Station as the locus of transfers in the area once it opens. I forgot about Rainier-UW riders switching to Link. Still, I think it would have been better to keep the 48 on 15th to 65th rather than prolonging the 71. That would have preserved the unity of 65th down to the Montlake freeway station and 23rd. I lived at 56th & University Way from 1989 to 2003, and have hung out in the U-District since I was a junior high kid in 1980. At 55th it’s apartments from the east side of 15th to Roosevelt. 55th Street at Roosevelt has small-lot houses, but apartments and business destinations are just a couple blocks away. East of 15th appears to be single-family houses but they’re choc full of students without cars. 55th Street is a mixture of student and post-student, but it’s one of the areas with low car ownership and high walking and transit use. That’s what makes it part of the U-District urban village, and people who live in the U-District go up to 65th & Roosevelt to shop all the time, but further than that it drops off significantly. The whole area is as dense as a San Francisco neighborhood that we wouldn’t hesitate to have frequent grid routes a few blocks apart. The 62 is the north end of that conglomoration, and the reason to keep the 48 up to there is to reach the 62 and the businesses and residents there, especially until Northgate Link opens. I pulled up 55th in Street View and while there were a handful of apartments between the Roosevelt/11th alley and the Brooklyn/Ave alley, it’s still mostly the sea of single-family and single-family-adjacent homes I remember. And while living just north of 55th I rarely walked any further north than Roosevelt High School, that’s as much because I didn’t need to as anything else. Roosevelt last I checked is lined with businesses clear to 75th, including Safeway at 75th, and if the Safeway on Brooklyn didn’t exist I’m sure at least some people closer to Ravenna Blvd would make that walk. The Roosevelt Square development is/was the main thing separating the Roosevelt/65th area from areas further north; just because it’s within walking distance of the area you’re talking about doesn’t make it the same urban village any more than the businesses north of there. I doubt people living closer to 50th or 47th are walking much further than Ravenna if they need to, especially since there were few businesses in that area (certainly other than Whole Foods) you’d go out of your way to get to, at least on a regular basis. All of which is to say that, while I’m not sure it was the right move, I understand why Metro would truncate the 48 where it did, and it would seem the obvious move that someone like you would have to argue against. As a job center, the U-District doesn’t really extend any further north than 45th, and there isn’t much along the 48’s route, or even along a connection that wouldn’t be better served with the 49 or Link as the first leg, that someone living in the U-District (certainly any UW students) would want to go to, *maybe* Garfield High or Swedish Cherry Hill. I say that not to denigrate the 48 in its current form but to try and explain why keeping the 48 to 65th, while plausible, doesn’t seem to immediately make sense from Metro’s perspective, or even from the perspective of someone (me) who lived only a few blocks away from you in roughly the same area. Keep in mind, the 542 going to Green Lake is normally considered an “extension” from what would otherwise be its expected route, because no one thinks of that area as the U-District, yet its only a couple blocks west of Roosevelt/65th. I definitely like that option – especially with East Link open, which should have a better (northbound) transfer environment than Mt. Baker, and will be a faster train ride to downtown. Southbound, I can see people taking whatever Link train comes first. If it’s going to Bellevue, switch to the 7 at I-90/Rainier. If it’s going to the airport, switch to the 7 at Mt. Baker. And, of course, for the area around 12th/Jackson, there wouldn’t even be a transfer. You’d just get off the #7 bus at Jackson and walk one block. In a dream world with bus lanes everywhere, the new #7 could continue up Boren all the way to Fairview, then take Mercer over to the Seattle Center. It would provide a lot more unique value than a #7 that simply becomes Yet Another Bus Down 3rd Ave. If you want to go downtown, just switch to Link. Unfortunately, in a world without bus lanes, I’m concerned that having the primary Rainier bus fight SLU/First Hill traffic earlier up the route would make for southbound service within the Rainier Valley that is very unreliable during peak. For all the faults of 3rd Ave. downtown, at least it’s a (mostly) bus-only street, so the buses will move. With regards to north U-district, I used to live there until a couple months ago, and the density is more than it seems. Many of what looks like single-family homes from a satellite view are actually rented out to students, and 4 college students generates a lot more transit ridership than a family of two parents and two kids. For transit service, I would either walk to 15/43rd, ride a Lime Bike to Link at UW Station, or occasionally catch the 70 at 15th/50th. In practice, penetrating the area with buses going closer (like the old #30 did), isn’t really all that useful because the travel for a bus is slow (lots of turns, lots of stops), and that the distance is short enough that by the time you wait for the bus, you may as well walk. It is also worth noting that from where I lived, the walking route to the main part U-district was considerably shorter than walking the bus route – I would take residential streets and cut diagonally through campus, avoiding nearly all of the stoplights in the process. Having the 48 continue on 15th to 52nd would have been nice, but the truncation at 43rd was not the end of the world. First of all, the 7 isn’t going away. You can call a bus on Boren the new 7, but that would be silly, because it would mean you would have to rename the old 7. It makes way more sense to just add another bus and call it something else. As for the original plan (involving truncating the 7 and extending the 48), I think Morgan nailed it. This has to do with connecting the 7 and 70 (as RapidRide lines). Truncating improves reliability. I’m not surprised they are moving away from that idea. The truncation seems like it costs riders a lot. You would be forcing a transfer very close to downtown. The transfer to Link at Mount Baker is awful, and a bus transfer would simply be a degradation. You could transfer to Link at Judkins Park, but that still isn’t great. If you actually improve travel along Rainier Avenue (the whole point of that RapidRide project) then no one will want to transfer. Once you add up the time to get to the platform, wait for the train, ride it, then get back up to the surface it just isn’t worth it. Meanwhile, you’ve split up Rainier Avenue, which means some trips (e. g. 12th and Jackson to Edmunds and Rainier) would require a bus transfer. That being said, I understand why they wanted to do that. It makes for an efficient system. You force a lot of transfers (especially to Link) but the buses run a lot more frequently. But I’m not sold on connecting the 7 and 70. I think the 70 will prove to be unreliable. The changes downtown and on Eastlake are great, but there is a lot of traffic on Roosevelt, and nothing will be done about it. You also have the bridge, which means extra waiting. Furthermore, splitting and overlapping downtown, while inefficient, would lose very little in terms of through rides. That is what makes it different than splitting the 62 in Fremont. Fremont is not a big destination while Downtown is. You overlap downtown and the vast majority of riders don’t even notice (not that many people are going from Rainier Avenue to Eastlake). As for the northern tail of the 48, it is fine as is. About the only change I would make is sending it over to Brooklyn (closer to the Ave.) Brooklyn is fine as a terminus (for buses coming from the south). It is a nicer street, runs right next to the Link Station and is easier for a bus to manage than 15th. You are right that the 48 doesn’t carry that many people. I’m sure some of the ridership is split with the 8. If you are between 23rd and MLK and want to go a mile up the road, then you toss a coin in terms of which bus to take. The plan is to reduce service on MLK. The 8 wouldn’t even go there (it would instead be sent to Madison Park) and a less important bus would serve MLK. That means the 48 would run more often, while service on that part of MLK would be less frequent. It is also worth noting that I expect the 43 to go away as soon as Madison BRT gets here. I would imagine all those changes would bump up ridership on the 48. So would sending it down Rainier Valley. The problem is, you have three bus routes (coming from the north) all converging into Mount Baker. This is similar to the situation in Lake City. Except unlike Lake City, Mount Baker is not the highest populated neighborhood in the area. This means that truncating there is not great. It is a tough trade-off. Either you redundantly send all three buses down Rainier, or you truncate a couple of them, and live with less functionality. For service down Rainier, I would prioritize the 7. It is where most people want to go. After that it is pretty much a coin flip. I would say, though, that a Lower Queen Anne/SLU/Boren bus does not have to be that long to be very effective. It might make sense to just truncate it at Mount Baker, just so you can run the thing more often (there really is no logical truncation point short of there). Then the 48 goes back to serving Rainier Valley, which could be just fine. It does mean a couple bus routes on Rainier Avenue (which means it is a bit redundant) but they split relatively early, and the 48 would likely not run as often as the 7. This also means that more buses could take advantage of bus lanes added to Rainier Avenue (assuming that happens) as well as off board payment stations (which are a given). Route 48 from Montlake to Mount Baker is mostly serving residential destinations. Retail is limited to ground levels of mid-rise apartment buildings. The 23rd/Jackson shopping district is no longer the hub that it was. Thus, it’s primary future market is as a residential feeder service like Route 8. As an alternative to an Outer Rainier/ 23rd pairing, I’d prefer an enhanced 9X. It’s really hard to get to First Hill medical appointments from SE Seattle. Better yet, operate the Jefferson to Mt Baker segment on Jefferson/ 23rd/ Rainier rather than Broadway/Boren/ Rainier to serve Cherry Hill too. As far as Route 48’s future, I’d like to see it run fully through the Rainier Valley business district and serve another residential district on the other side — say replace the Seward Park segment of Route 50 or climb into Beacon Hill. You can’t put the 70 on Boren. It’s being replaced by RapidRide Roosevelt, and downtown is must-serve in the spec. If you want to connect the 7 and 70 it would have to be on 3rd Avenue. Metro’s 2025 plan calls for a modified 106 on Boren. (QA/Mercer – Denny Way – Boren – -Rainier – MLK – Rainier Beach – 56th/Rainier) STB commentators have long urged for a route on Boren between Rainier Valley and SLU, and this is what Metro came up with. East-west service in the Mercer corridor is sorely needed, as is service from the Rainier Valley area to SLU (reroute the 106 to there instead of terminating in the ID, which duplicates (triplicates?) existing service. Metro seems to be afraid to touch Mercer until Seattle can make a commitment to bus lanes there (which doesn’t seem likely anytime soon). The general plan it so run buses on Harrison, once you can cross Aurora there (which is only a few days away). The idea would be run the 8 there, while the new Rainier Valley/Boren/South Lake Union/Lower Queen Anne bus runs on Mercer*. I would do the opposite, and basically keep the 8 as is (at least in that part of town) but send the other bus a bit farther north (https://seattletransitblog.com/2018/11/15/east-seattle-bus-restructure/). * http://www.kcmetrovision.org/wp-content/themes/kcmlrtp/LongRangePlan/# bus number 1074, which is visible if you look at 2025, and show “Frequent” bus routes. Part of Metro’s plan is more service between Magnolia/Queen Anne and Capitol Hill. The variations for the 8 are Harrison-Denny-Madison (to Madison Park), and the 2040 plan extends it west to Interbay and Emerson Street (replacing part of the D). A second corridor is the Lakewood Blvd – E Aloha Street axis, which has never had bus service. Metro plans to overlay two 30-minute Local routes creating a 15-minute overlap between QA & Mercer to East Aloha Street and Garfield High School. One would serve the 2’s tail (6th Ave W), the other the 24’s tail (Viewmont Way and Discovery Park). I think this is one of the questionable corridors because Lakeview/Aloha is pretty meandering and business-lite. So I could see it being one of the first to go away if there’s a recession or a tight budget. The I-5 barrier limits east-west corridors to Denny Way or Lakeview Blvd. There have been suggestions for a Harrison Street bridge, to get out of the Denny bottleneck and get closer to the middle of the Capitol Hill commercial districts, but it would be expensive and probably difficult to get SDOT to do it. I’ve long been a fan of sending routes up the Lakeview Bridge en route to Capitol Hill Station to solve problems with existing routes such as the 8 being bogged down on Denny. But I don’t think of Aloha as a corridor really warranting any, much less frequent, service. I actually proposed sending a Lakeview Bridge route down Bellevue/Summit to cover the 47’s current coverage area before heading up Olive Way to CHS. Service along Aloha should be seen as part of an overall restructure, where we make the area more of a grid. Right now everything north of John/Thomas consists of buses that go north-south, often curving to serve the area. This makes for very awkward trips. For example, from 15th and Mercer to Fairview and Mercer, you have to live with a long walk to the 8 and back again. It is a 12 minute walk for an 8 minute bus ride (if you are lucky). This is for a distance of one mile (as the crow flies). As you move further north (towards Aloha), it just gets worse. You eventually get to the point where you are better off taking a bus south to downtown, then back again. It is true that density drops as you go north, but it is still higher than much of the city. It isn’t so much that you serve Aloha, as you make it easy for folks close to Aloha to get a bus heading west (to the South Lake Union part of downtown). I see a Lakeview/Aloha bus as a replacement for the 12, once Madison BRT is running. It covers the area just as well, while providing a much needed reliable east-west connection. One other thing I’d like to see in Metro’s annual performance report is performance measures. Ridership is a good start, although it is currently rounded off to put many routes in the under-100 category. ST has a useful list of performance measures. One other performance measure I’d like to see is net fare recovery. Gross fare recovery is a useful political talking point, but doesn’t tell us how much is being spent on fare collection, including capital replacement, fare enforcement, estimated dwell time added by fare collection, and multiplier effects as buses get stuck behing a dwelling bus. Bring that information to the table, so we can have a better-data-informed discussion on the utility of fare collection. Yes, Metro should include total ridership and ridership/route mile in these performance reports. Boardings/hour as a metric only tells you about demand relative to current service, but not about absolute demand along a certain route. For example, a very high boardings/hour could mean that a route has very strong ridership, or it could mean that Metro provides way too few service hours. The tough thing about route fare collection data is the allocation of both transfers and Orca. Are only the initial boarding fares counted? If not, how would Metro assign transferring revenue — by number of boardings, distance of each part of the trip or time on each part of the trip? How would the data of riding only a certain route segment with a transfer be allocated for the entire route? Metro counts “linked” vs “unlinked” trips, where link means transferring. My impression of how the revenue is calculated is it’s split relative to the difference in fares, not by how much of the route you were present on. Metro’s fares are all the same so it would be split evenly. ST’s fares are usually higher so it would get a disproportionate share. That’s just my guess; I haven’t seen the formula. I’d love to see a “Cost of Congestion” metric developed on a route or corridor level. We’ve invested so many service hours in “reliability”, aka padding, basically the closest thing to literally throwing money out the window in order to create a more predictable (not better) customer experience. Those wasted service hours are an indirect SOV subsidy…they are only needed because we oversupply SOV access and undersupply transit priority, an they directly harm frequency potential. Divide the number of service hours on a route or corridor by the free-flowing average speed, and compare that to peak speed. Would that give us a useful number or ratio? I’ve always wanted to quantify exactly how much congestion costs Metro, ST, and CT. Yes! Metro is in a holding pattern now until Northgate Link and RapidRide G (Madison) open in a few years. At that point there will be two major restructures like the U-Link one or the RapidRide C/D one (or maybe both Northgate and Madison will be combined into one double-sized restructure). Metro will have more service hours when it converts the 74, 76, etc into feeders. That doesn’t directly address congestion but it can fix some legacy inefficiencies that were either impossible without Link or stagnated because Metro wanted to restructure once rather than twice. An index of SOV-caused inefficiency is definitely needed to inform these decisions. Metro tracks ridership hours vs coverage hours, so it should also track “SOV-imposed inefficiency” hours. Maybe it does to some extent, and just needs to make it more visible, and prioritize it more in discussions with the cities. Adding a transit lane allows a bus to make more runs per day, which gives you greater frequency and rider satisfaction “for free”. That should motivate Metro and the cities to do it, but that hasn’t quite trickled up yet. The same way that ST could increase Link’s capacity by ordering trains without interior cabs and with fewer 2×2 seats and open gangways, but so far it hasn’t trickled up to the level of doing it, even with the potential ST2/3 capacity crunch between downtown and UW. Underservice in South King County? Well, that is what happens when the leaders regard your area as being full of second class subhumans. That’s what happens when that subarea votes against transit and brings a whole countywide package down. We voted against it for a variety of reasons. Like the increase in taxes were unaffordable for many residents of the area. Also there was a lack of trust that the money raised would actually be used properly. We had concerns and the response was shut up and vote for it. Having a car and driving it costs more than transit. As for the money being “used properly”; I won’t delve into the gap between those people’s expectations and Metro’s performance. Metro has a longstanding practice of keeping service hours in the subarea and adding them in proportion to the subarea, so I don’t see what the problem is. As to what the additional service would look like, Metro has already done a couple restructures in south King County to eliminate the long milk runs (e.g., Des Moines to downtown) and replace them with frequent trunks (A, 120, 150) and more routes between South King cities (all directions around Southcenter and Kent). Additional funding would probably increase the frequency/span of those new trunks and feeders. There are plans for new “expensive” RapidRides, but they weren’t part of the previous packages and I think they’re a different ballgame, so that’s not directly comparable, especially since the county hasn’t committed yet to which RapidRides would be in the package or what their budgets would be. By “not committed” I’m referring more to the size of the package rather than the routing. I think the routing will remain similar to the long-range plan in south King County. But I question whether the county has the fortitude propose such a large package to do everything in the 2025 plan in one phase. So we may see only one or two RapidRide lines in south King County in the next phase rather than all of them. If so, I think KDM-Kent-Auburn would be first. Kent really needs better access to Seattle, and the meandering on Reith Road just doesn’t cut it. At the same time you can’t just cut off West Hill from transit because it’s a long hilly walk to anything. So I see RapidRide or Express on KDM Road as the only way out of the dilemma. I live on the edge of Seattle and Burien, it takes me two hours to take the bus to where I work on Capitol Hill whether I take metro or metro to link Light Rail. It takes me 25 minutes to drive. If I could get public transportation that took no longer than an hour to get to work I would but the south end is severely underserved. I don’t have time to spend 4 hours of my day commuting. I grew up in lake city and it took me 45 min to an hour to get to Capitol Hill on the bus, north seattle is just better served. Give the south end real options and they will take it.